The returns you expect. Less risk and volatility. Our investment approach is purpose built to protect and grow capital in a more stable fashion than retail investment portfolios. You can’t deliver results that stand out from the crowd if you follow the crowd. At Newport, our investment mindset, our ownership structure – even our strategic location away from Toronto’s financial district – are rooted in independence. Investment strategy is led by the Newport Investment Committee – a brain trust of 10 investment professionals with diverse professional backgrounds, investment experience – 28 years on average – and networks for sourcing opportunities. The Committee analyzes and interprets the economic and investment environment, sets strategy and asset mix accordingly, and executes through carefully-sourced, independent asset class specialists. Sometimes, the strategy requires conviction to invest in unloved areas of the market; other times, to scale back on sectors where popularity has led to overvaluations. Having diversity of opinion at the table is essential – fostering more creative thinking, vigorous debates and better investment outcomes, as only the best ideas survive scrutiny. For most investors, ‘diversification’ means owning a mix of traditional public securities – stocks, bonds, ETFs, mutual funds and REITs – to spread risk and enhance returns. Asset mix is traditionally ‘60/40’ (60% stocks, 40% bonds) or a variation thereof, depending on age and risk tolerance. What makes Newport different is that we operate from an uncommonly broad investment universe of a dozen different asset categories and our asset mix is dynamic – meaning we re-allocate our capital – overweighting or underweighting certain asset classes – as market circumstances change. We are not traders. The asset mix moves we make are incremental and deliberate – but over time they are significant. The illustration is a representation of asset category allocations for a typical balanced portfolio. Allocations are typically made through our proprietary Newport Funds and will change due to market conditions, our investment strategy and the unique situation of every client. After the market correction of 2008, corporate and high-yield bonds became very attractive relative to government bonds. We sold all our government bonds and re-allocated capital to corporate bonds and our portfolios profited from the opportunity the market gave us. In 2010, after the U.S. housing market crash, we saw a buying opportunity in U.S. garden-style apartment buildings. Today, we have an interest in more than 60 buildings in various markets, providing steady cash flow through rental income and growth through value appreciation of the real estate and enhancement of the asset. Dynamic asset allocation is an important plank in our investment platform, as multiple research studies have shown asset mix explains approximately 90% of a portfolio’s variability of returns. Alternative investments have long been the domain of ultra-high-net-worth and pension fund investors because of their diversifying and return-enhancing effects. Today, as alternatives have become more accessible through mainstream channels, retail investors can now also participate. However, in our experience, there can be a material difference in the quality and terms of alternative investments accessed by an institutional or ultra-high-net-worth investor versus what is available to the lay person. At Newport, we have been investing successfully in alternative investments (e.g. 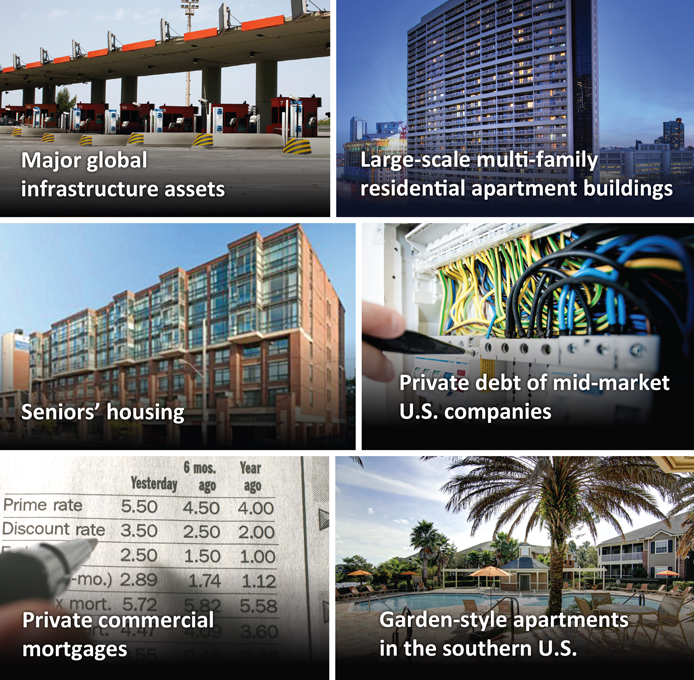 real estate, private equity, mortgages, etc.) for over a decade. We’ve built the analytic expertise and cultivated the scale, networks and reputation to invite participation in some of the largest, institutional-only opportunities available today. The prudent use of alternatives within our asset mix has been a major contributor to the quality of investment return for our clients. The size, caliber and terms of the alternatives we add to client portfolios are generally preferential to those available to retail investors. Using third-party independent specialists allows us to tap into focused expertise for different markets and be totally objective about where we allocate capital – something that couldn’t be achieved with in-house managers. Because of our size and business track record, we have access to some asset class specialist firms that are not open to retail investors. Within a single asset class, we’ll retain multiple sub-specialists. Using multi-family residential real estate as an example, we have one specialist manager for garden-style apartment complexes in the southern U.S., two that invest in large apartment building in major urban North American centres and another that is laser-focused on seniors’ housing in eastern Canada. Our Investment Committee is active in the management and oversight of third-party expertise. We monitor trading daily, ensuring they are acting within their mandates and avoiding the potential for duplication. We formally adjust asset mix quarterly, potentially reducing the amount of capital placed with one specialist, allocating more to another to reflect our outlook. You can contrast this with the experience of owning multiple mutual funds or ‘fund of funds’ where investors have limited perspective and no control over the securities held inside the portfolio. Investors may think they are properly diversified when in fact they just have more of the same. Our active approach allows us to maintain overall management responsibility and accountability for portfolios while taking advantage of applied expertise that is additive to our own. It is considerably more work to do things this way, but we believe the effort shows in our results. Rate of return is one part of investment performance. Risk and volatility are the others. How much risk did you take to earn a given rate of return? And how much volatility did you experience along the way? These factors make up the quality of your return – and your investment experience. Savvy investors know – and statistics support – the straightest path to protecting and growing wealth is through steadier returns. Our investment approach was built to deliver the returns you expect with lower risk and volatility. This has been our track record and a significant contributor to our growth as one of Canada’s largest independent wealth management firms for high-net-worth individuals. We set Newport up as a home for the investment of our own capital, inviting like-minded families to invest alongside us. Our entire investment approach is designed to foster alignment and reduce the potential for conflict of interest. We expect the same of the third-party specialists that provide specific asset class expertise for our portfolios. We want to invest with people who are aligned with us and have turned aside many opportunities where this is not the case. It’s a simple concept but uncommonly fulfilled. Newport’s wealth management services are suitable for individuals with a minimum of $1 million in investable assets. If you think our investment approach is what you’re looking for, we invite you to get in touch. We also offer services for individuals and families with $200,000 or more to invest through Lonsdale Portfolios, a division of Newport Private Wealth.